Boris & Horton dog cafe. Photography by tiffgifphotography.com. New York City has everything, and now it also has a place to hang out, dog leash in hand with your beverage of choice, be it a glass of wine or cup of coffee. 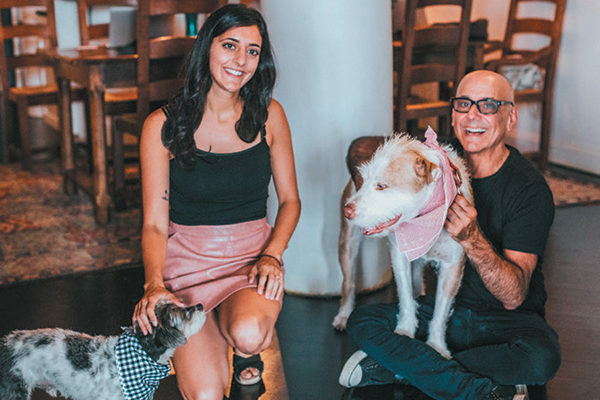 Father and daughter duo Coppy and Logan Holzman named the café Boris & Horton after their dogs. There will be a café side to get your drinks, pastries and sandwiches and a dog-friendly lounge side. Opens in December, so check out borisandhorton.com for updates. Macy’s Holiday Windows. Photography by Rob Schroeder. Make Macy’s in San Francisco part of your holiday tradition starting today through the end of 2017. Once again, the department store will be home to Holiday Windows, where the San Francisco SPCA highlights different adoptable cats and dogs in beautifully decorated store window fronts. Last year, the SF SPCA adopted out more than 800 animals over the course of Holiday Windows 2016. Now that’s a holly, jolly thing! Go to sfspca.org/holiday for more details. Dogs get their own holiday party at the Midtown Mutts Dog Park in Oklahoma City, Oklahoma, from 6 to 8 p.m. Bring your pups to get a photo with Santa, enjoy a puppuccino, snag a goodie bag and participate in a silent auction. All proceeds benefit the Midtown Association. Find more info on downtownindecember.com/dog-day-december/. 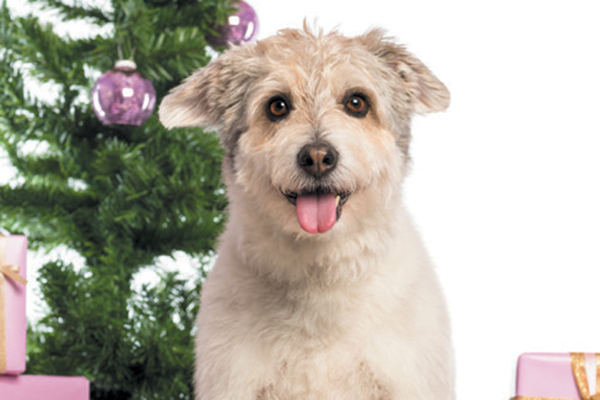 Celebrate your mixed breed dog on December 2. Photography ©GlobalP | Thinkstock. Celebrate by taking your special mixed breed friend for an extra-long walk or baking some yummy holiday dog treats (see page 12 of our December / January issue for recipes). 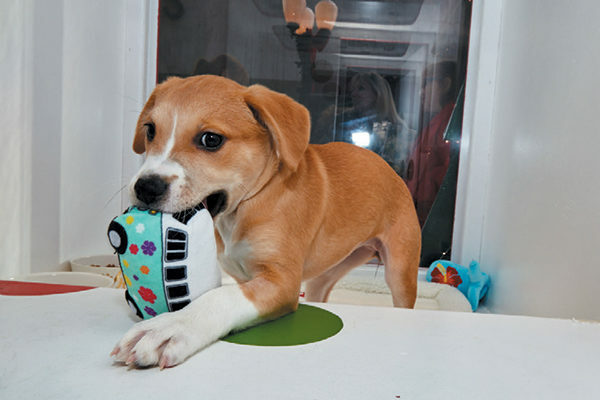 Help other mixed breeds by donating time or money to a shelter of your choice. Make it a great day for your special dog! Join this pup parade in Breckenridge, Colorado. Register at 3 to 3:45 p.m., partake in light refreshments and take lots of photos. There will be free Santa dog costumes for those who want to join in the parade and don’t have one. Parade starts at 4 p.m., marching from Main Street Station to the Blue River Plaza. Lighting of the town tree is at 5 p.m. Go to gobreck.com for more details. Put on your holiday glitz, have fun and give back this season by attending a black tie gala dinner hosted by The Order of St. John in Manhattan, held at New York’s exclusive Metropolitan Club at 7 p.m. You’ll find cocktails, dinner, dancing and a silent and live auction, all benefitting the Guide Dog Foundation and America’s VetDogs. Get more details by emailing Dame Claire Burke ([email protected]) or calling 212-534-2676. Want to get a photo of Fido with Santa? Head on down to Homestead Gardens in Davidsonville, Maryland. Just give a small donation supporting the SPCA of Anne Arundel County, take a photo, enjoy a beverage and get into the Christmas spirt. 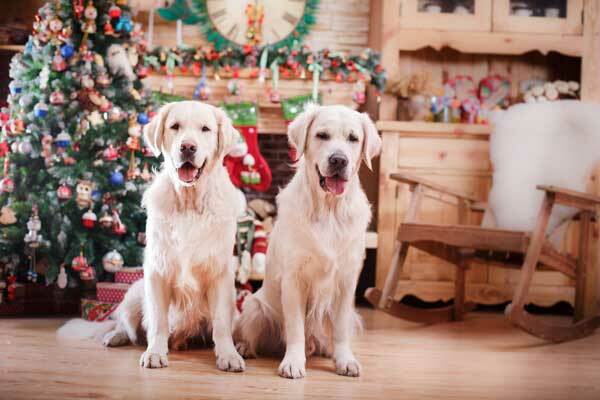 Your dog’s photo can be taken on Santa’s lap or held by family members. Event runs from 5 to 8 p.m. More details on homesteadgardens.com/upcoming-event/santa-paws/. Gaslamp Holiday Pet Parade. Photography Courtesy GSO Productions. 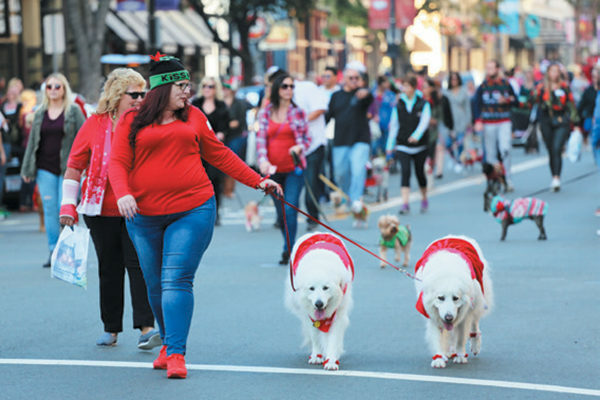 Jingle over to Southern California for The San Diego Union-Tribune Gaslamp Holiday Pet Parade, presented by Blue Buffalo. Got a dog that loves the spotlight? Enter Fido into one of the many contests. Pet Expo is from 1 to 5 p.m., and the parade starts at 3 p.m. Get registration information and more at gaslamp.org. Grab your pup and some popcorn and check out the Canine Film Festival Best Films of 2017, TBA blockbuster film and a sneak peek at Canine Film Festival 2018. Takes place from 6 p.m. on at the Cinépolis Movie Theaters in Miami, Florida. Go to eventbrite.com for more information.